Free Up Your Floor Space! 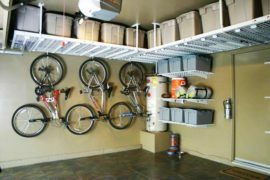 The NewAge Products Performance Adjustable VersaRac Ceiling Storage Rack in Grey is a simple solution to freeing up floor space in your garage or workshop. Durable, sturdy and strong with 13-gauge perimeter support beams reinforcing 4 mm diameter wire grids, this rack provides 104 cu. ft. of storage space with a 600 lb. storage capacity. The height-adjustable rack can be installed as low as 18 in. with additional adjustment notches at 27 to 42 in. and has two width adjustments, taking it from 6 ft. to 8 ft. Ideal for storing coolers, luggage, file boxes, sporting equipment or practically any item, this rack has a powder-coated finish that protects against scratches and rust for lasting beauty and is available in grey or white.